When we’re living out our faith every day we do things differently. Evangelism isn’t just something we do, it’s how we live our lives. So what does living missionally look like? We sit in the stands differently. 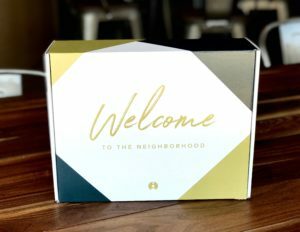 We recently heard an awesome story of neighboring differently as Sheila Mitchell shared with us her experience delivering a Welcome Box with her 14-year-old grandson to new residents in our community. Recently, my grandson and I were delivering Welcome To The Neighborhood Boxes. I was excited that my 14 yr. old grandson (Avery) wanted to serve with me. We enjoyed meeting new people and inviting them to our church. We met a couple that were very new to the area and chatted with them for awhile. 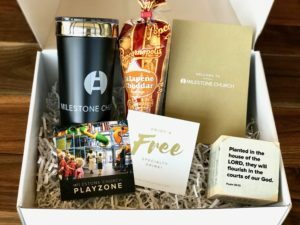 They had questions about our church… location, times of our services, and we told them about the Playzone area because they have small children. They even said they had been talking about trying to find a church. We left their home feeling excited about meeting such a nice family! My husband and I normally attend the 9:30am service, but on August 20th, my youngest grandson was getting baptized in the 11:15am service-so that’s when we attended. During the “meet and greet” time we turned around and this family was sitting right behind us. Wow! What a blessing to see them! I couldn’t wait to tell my grandson! It is so neat to see how God orchestrated so many things for us! I give God the glory for the opportunity to serve Him and others. What a sweet gift from God to let us see so quickly the fruits of our serving. Sheila and Avery, we’re proud of you guys! Thanks for reaching out to new families in our area and living out your faith in such a practical way. All because of faithfulness in the little things – putting together a box that shows we care. Love it!